• Farmhouse Sentiments is a 20” x 38” printed panel with 10 embroidery designs (sized to fit 5” x 7” hoops). Designer and Editor, Eileen Roche has taken a fresh new approach to quilting with Farmhouse Sentiments. 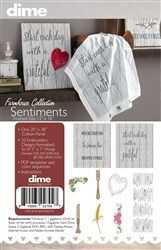 Farmhouse Sentiments is a 20” x 38” printed panel with 10 embroidery designs (sized to fit 5” x 7” hoops). The panel includes two projects – Gather and Grateful. Each panel can be quilted with the included wood grain quilting designs and embellished with any of the six embroidery designs. As an option, you can personalize the panels further by adding a family name or date using your own software or built-in designs in your embroidery machine. Once the embroidery and quilting are complete, apply the finished project to a stretched canvas for a unique wall art. Or bind the quilt to make a wall hanging. Give one, keep one! 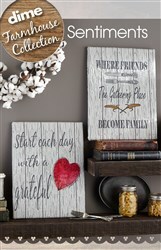 Farmhouse Sentiments includes two unique panels–you can make them as gifts or keep for your own décor! Each finished panel measures 12" x 16".